SEATTLE--(BUSINESS WIRE)--Sep. 6, 2018-- (NASDAQ: AMZN)—Amazon today announced the next generation Fire HD 8—now with always-ready, hands-free access to Alexa. With up to 10 hours of mixed use battery life, the all-new Fire HD 8 offers a stunning 8” HD display with over 1 million pixels, a quad-core processor, 16 GB of internal storage with support for up to 400 GB more, plus hands-free access to Alexa—only $79.99. The all-new Fire HD 8 is available for pre-order today at www.amazon.com/firehd8. 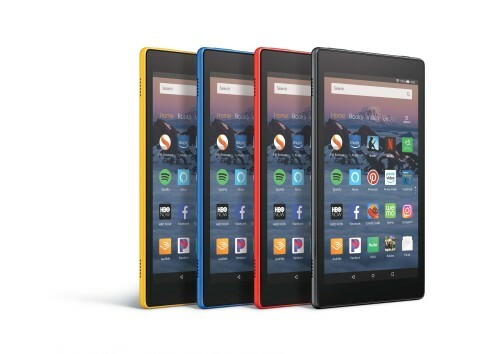 In addition to the Fire HD 8, Amazon also today introduced the all-new Fire HD 8 Kids Edition tablet for $129.99, available for pre-order at: www.amazon.com/firehd8kidsedition. The Fire HD 8 Kids Edition will start shipping on October 4. Amazon also today announced Amazon FreeTime and FreeTime Unlimited is now available in Spanish—for more information, read this press release.